Worcestershire suffered relegation back to Division Two as Durham ended their County Championship campaign with a three-wicket win at Chester-le-Street. Bottom-of-the-table Worcestershire needed a win to maintain their hopes of survival in the final round of games. And after a hectic morning they declared on 217-9, a lead of 290. Scott Borthwick put on 104 with Paul Collingwood (43) and although he departed for 99, Michael Richardson's unbeaten 65 steered Durham to 291-7. Worcestershire deserved credit for their efforts to force a positive result out of a game which saw no play on the second day because of rain. They added 175 to their overnight 42-0, Brett D'Oliveira falling one run short of a half-century before Ross Whiteley, named in the England Lions tour squad on Thursday, blasted 47 off 21 balls. Ryan Pringle (3-45) and Graham Onions (3-63) were the most successful Durham bowlers, with Chris Rushworth only managing one wicket to finish the summer with 83 at an average of 20.61 - and 100 wickets in all competitions. Shannon Gabriel soon saw off Jack Burnham when Durham began their second innings, but Borthwick and Mark Stoneman added 75 to lay a foundation for the run chase. Borthwick found the perfect ally in skipper Paul Collingwood, only to fall short of a century when he was lbw to one that kept a little low from D'Oliveira, who took 2-85. Gabriel (2-56) had Collingwood caught behind soon after but, although Worcestershire continued to pick up wickets, Richardson's calm innings sealed their fate. 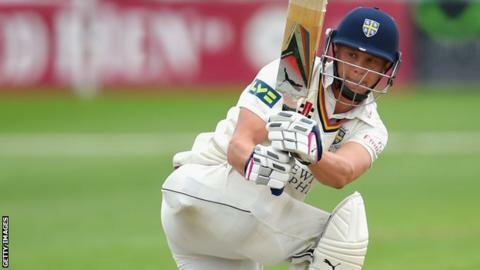 The victory was only Durham's second in eight games to end a run of four successive defeats. "It was a much needed win. We've had a couple of difficult months so to put in a performance like that at the end of the season was a good effort from all the lads. "The batting hasn't functioned well enough. This was a good cricket surface and there was a real good challenge between bat and ball. "We were getting performances in the first half of the season that were exceptional and in the second half of the season we haven't had as many. The level of the side didn't deteriorate a great deal, but we have to raise the bar across the board." "It got a bit twitchy at the end and the light situation played into our hands a bit. "It's good for morale and confidence that we have finished with a win. We didn't want to end up stewing on a season of missed opportunities." "It's disappointing because we made the play in most of this game, but we lost a day to the weather. We set it up well this morning and tried hard, but we didn't bowl quite as well as might have. "We were also robbed a bit by the light fading. When they were seven down it would have been good to bring Shannon Gabriel back. "It's been a hard season with no international players and the Collingwood-Borthwick partnership showed the value of experience. "But other teams know that, in two or three years this group will still be together and they will be a good side."